We will be hosting a series of ukulele group lessons over the school holiday period, perfect for beginners and people who are new to music. 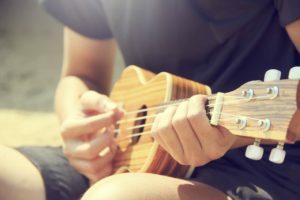 In our Ukulele group class, students will gain hands-on experience with the fundamentals of playing a string instrument, incorporating technique, basic music theory, timing, and rhythm, in a fun and very hands on way. The Ukulele is a fantastic gateway instrument to the greater music world, while also being an incredibly fun instrument all by itself. This course is specifically tailored for those new to playing a musical instrument as students will first learn the basics, such as movement and coordination of both hands, timing, and basic rhythm. After learning the basics, students will then be guided through a few project songs to get a deeper feel for what the instrument can do as well as start to develop a repertoire of pieces to perform for their friends and family. The cost is $90 for the class (includes 6 one-hour lessons), and prepayment is required in order to reserve a spot (places are limited). Students must bring their own Ukulele, but every other resource will be provided! Contact us or fill out the form below to reserve your spot or for more information. Please see below for our terms and conditions. The Ukulele Group class must be prepaid in order to guarantee a place. Places are limited. You will not be guaranteed a place until payment has been made in full. The class must be prepaid in full in order for the attendee to commence the three week course. If you wish to cancel your place in the class, your payment is fully refundable only up to 7 days before the start of the course on January 7th, 2019. If your payment is made within 8 days of the start of the course, your payment will be fully refundable only within 24 hours after payment is received. By paying for the class, you are reserving a limited place. Refunds will not be given if you cancel your place in the class less than 7 days before the start of the class or after the class has already commenced on January 7th, 2019. Refunds or discounts will not be given if the attendee is unable to attend all class sessions on January 7th, 10th, 14th, 17th, 21st, and 24th, nor if they are unable to attend for the full time of the class on those dates. If the attendee is unable to attend the class, you may transfer your place to another person who is 14 years or older before the start of the class at 6:00 pm on January 7th, 2019. After this time, places are non-transferable. You are responsible for bringing a ukulele in order to participate. The attendee and their family who will be on our premises must abide by our standards of conduct, listed below. The first violation will result in a warning, repeated violations may result in the attendee being asked to leave the premises. If the attendee is asked to leave the premises due to violating our standards of conduct, you will not receive a refund in part or in full. You must not be disruptive to other attendees by creating excessive noise or distractions. You must respect others, including the other attendees and teachers, and must not use derogatory language or physical violence toward any person on the premises.